Before we get started I need to mention that there will be a lot of SPOILERS in this top ten. If you haven’t seen any of the movies from this list, continue at your own risk. What can I say? My imagination always wanders. Even a small detail could impact the outcome in a movie. 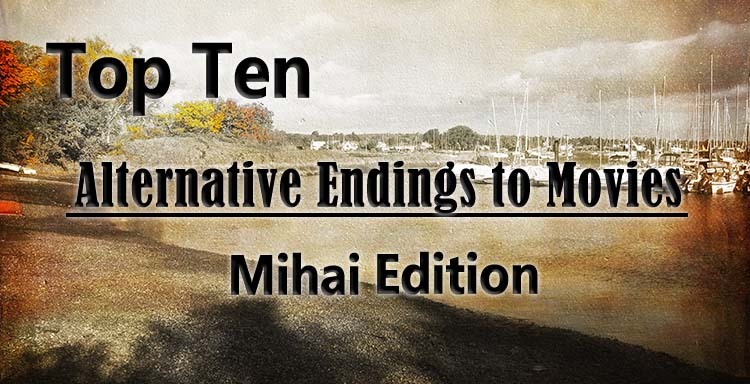 This is my top ten endings you might never had considered. Enjoy! In the original, we see Anastasia breaking Rasputin’s magical… I don’t know, test tube? And ending the curse. She hooks up with Dimitri and everything is happy and joyful. What do you expect? It’s a kids movie. Yet here is something that would add an almost spooky twist to the story. Imagine: Anastasia destroys the magical artefact that housed the little demons but Rasputin does not wither away, in stead the evil spirits take control over his body, making him there new vesel. The princes and magician fight a little bit longer but the ice from under thear feet finally gives out. Rasputin grabs Anastasia and tries to pull her down into the cold water with him. It is here when Dimitri steps in for a second time, saving Anastasia but falling with the wizard to their demise. The princes then takes the throne and swears to take care of Russia just as Dimitri has taken care of her. It’s a lot darker, I know, but come on! It’s a bit more interesting then a classical happy ever after. Don’t expect a big difference here. The main characters escape on the helicopter and we see John Hammond looking at the fossilized mosquito. He removes it from his walking stick and throes it down into the forest. It land on some tree sap and gets stuck there, creating a rather simple metafore. History will repete itself at one point or another. Simple? yes. Interesting? For me at lest, yes. Mister Burton. I love your work, I really do but why the weird ending with the break-dancing and the sudden “Oh, I am picking up my father’s mantle!” with Alice? Why not just let everyone celebrate in Wonderland for a bit, have a nice goodbye with the Hatter and then return Alice to the normal world as a strong, independent woman who will start her own way through life? Keep the ending modest and with a good message. Harry Po- I mean Arthur Kipps has helped the remains of a lost child reach his mother’s ghostly hands and left the haunted establishement with his son. They were getting ready to leave on the next train when suddenly, the Woman in Black lures the son on the train tracks and ends up killing both the child and father. Oh, come on lady! You killed a tone of kids and you’re still upset? Harr- I mean Arthur helped you find your lost son. Cut him some slack! My thoughts are clear. I wanted them to live. Next one. After some technical mambo jumbo, the Monster speaks normal english and Mister Frankenstein is left in a sleeping state as the towns people were getting ready to take him away. The Monster intervenes and clears the name of the good doctor. We see a funny little ending with the two main characters, trying to live normal lives. In my opinion, what would have made it a little more thought provoking was if profesor Frankenstein wouldn’t have awoken from his sleep and was left catatonic or in a coma. We would see the Monster and the other servants try to take care of him and remain together, as a family. Just to make things a little clearer, I am referring to the sequel of “Silence of the Lambs” Now returning to the topic, am I the only one who saw the brain eating seen at the end and thought “Seriously? What’s going on?” When Hannibal had that romantic dinner with Clarice and Krendler, it all felt too strange and not very constructive for the character of the polite canibal. It lacked finesse and stile, something that should have been connected to Hannible’s character. A normal dinner between the two adversaries, Hannibal and Clarice, on a boat that is at the brink of sinking would have been a bit more interesting and suspenseful. A very sad and fitting conclusion for the marshal, Teddy Daniels. After facing the horrors of his past, he decides to fake his delusion to have an operation, with the hope of his memories being removed. Now don’t get the wrong idea: I loved the ending and it did hit its mark, but coming up with our own interpretations and alternative endings are fun to do and keep us in awe for the original version. Try and imagine how different would it be if Teddy Daniels denied the reality and only pretended to be cured. He would have gotten out and tried to get revenge on the institution he was at for attempting to brainwash him. We would be left with a bitter ending, one where pain and sorrow drove a man into insanity. What would be there to fight for then? After such an epic ending, with Po reaching inner peace and destroying the fleet, why did they feel the need to finish off Lord Shen? Why not just hold him responsible and make him reform? It would have been a brilliant way of adding a new member to the Kung Fu family. I even see comedic moments between master Shifu and the new “student” Shen. The Joker needed a bigger send off. Sure, let him fall out the scaffolding and have Batman save him, but as the villain hangs there like a pinata, have commissioner Gordon step in with a gun. Now Batman wants to reason with the policeman to not kill the Joker, saying that taking his life would only taint his morality. Just as the conversation was building up, Gordon gets a call from Harvey Dent who has his family hostage. The rest of the ending would still be the same but try and imagine the commissioner riding with Batman on his bike, the policeman screaming in fear. I find it funnier then any joke the Joker made throughout the movie. Let me start by saying that I love this movie. It has a brilliant cast of actors that really stole the scenes and fantastic locations with depth and stile. To that end, I found the ending a bit disappointing. Well, it’s not bad, just unsatisfying for such a fantastic film. I was expecting a bit more conflict and even some supernatural influence. My bro and I even made a bet if the ghost of Carter Cushing, the father, would make an appearance. Sadly, he didn’t. Here’s my take on the ending: picking off with Lucille seeing her brother burning the document, Thomas would try and reason with his sister but she gets enraged. Edith would step in and save her husband’s life but doesn’t kill the sister. They go to the basement to help Dr. Alan but he bled out. In her rage, the almost dead Lucille would set the house on fire, making it harder for our heroes to escape. The supernatural element would step in. The ghosts of Carter Cushing and the kind doctor would finish off the deranged woman and save the couple. The last moments of the movie would be in the piano room, on fire, with the ghost of Lucille playing as the keyboards burn and fall apart. What are your thoughts? Were these endings fitting or not as good as the originals? Let me know in the comments.